New Delhi : Congress President Rahul Gandhi will be meeting a set of party leaders in Delhi to discuss a possible alliance with other parties like AAP for the upcoming elections. According to a report by NDTV, the sources say that Arvind Kejriwal's Aam Aadmi Party has two seats to offer to the Congress. The Congress, however, is holding out for three seats, sources said. AAP, on the other hand, has demanded all four seats it had won in Punjab then they can think about offering more seats in Delhi. In the 2014 national elections, the BJP won all seven seats of Delhi, but AAP has found tremendous support in Delhi. In the 2015 assembly elections, AAP won 67 of Delhi's 70 seats, the Congress drew a blank. 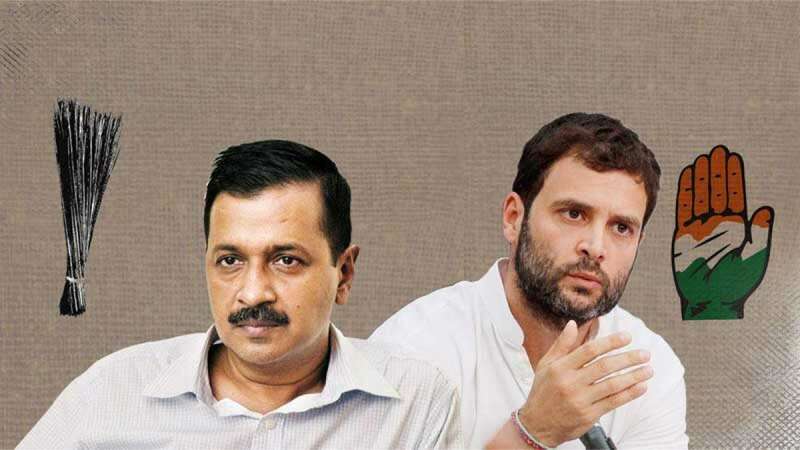 A couple of days back, Delhi Chief Minister Arvind Kejriwal has said that Congress has "refused to go for an alliance" and that he was "fed up" with repeatedly asking for a tie-up. Congress Delhi chief Shiela Dikshit, on the other hand, said that no talks were done on the matter. Sources told NDTV yesterday that Chandrababu Naidu and Nationalist Congress chief Sharad Pawar have both asked Rahul Gandhi to revisit the possibilities of alliance with Mr Kejriwal and Ms Banerjee.